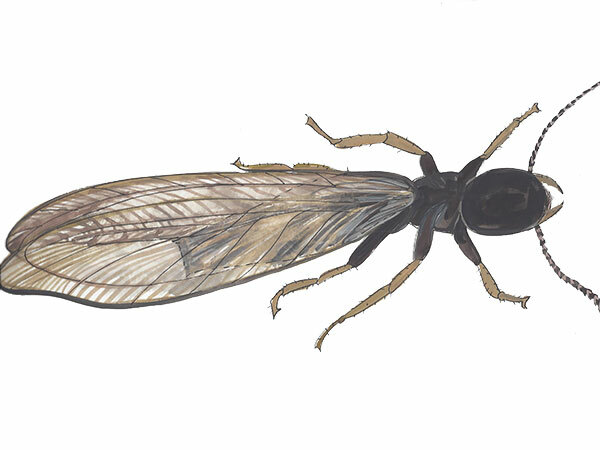 The reproductive subterranean termite swarms during late Winter/early Spring and usually after rain. They have 4 long grayish transparent wings with a thick black vein along the front end of the wing. Their body is black and they are roughly 1 cm in length. The worker subterranean termite has a creamy white body averaging 3 mm in length. Their head is round and their antennae are straight. The soldiers have long rectangular heads with long black mandibles or pinchers. Their head is dark orange and the rest of their body is light yellow to white. The soldier termite can range in length between 8-12 mm long. Subterranean termites can be found in every state in the continental United States, except Alaska. The eastern subterranean termite can be found as south as Key West and as north as Canada. In their natural habitat, subterranean termites are found infesting in fallen trees, dead tree stumps, old branches and just about any piece of wood touching the soil. Subterranean termites live in the soil to obtain moisture and build mud tubes that are used as shelter when leaving the soil in search of food. Subterranean termites also infest residential homes and commonly enter through cracks in a homes foundation or in areas where wood is in contact with the earth. Termites can gain entrance to homes though openings 1/32 of an inch or larger. Subterranean termites live in colonies underground and will travel up to the length of a football field in search of food. Workers forage for food 24/7 and build mud tunnels that connect the colony to above ground food sources. Once they discover a new food source, they mark it with a pheromone chemical used to communicate with each other. Subterranean termites will eat wood, paper, cotton, plants and even living trees. They obtain their nutrition from cellulose, the main structural component of plant cells. A mature colony can range from 15,000 to as many as 5 million workers. The primary queen can lay as many as 10,000 eggs per year. A newly hatched subterranean termite can develop into a variety of castes: worker, soldier or reproductive. The workers make up the bulk of the colony and cause the majority of damage to wood. Subterranean workers forage for food, water, care for the young, build shelter tubes and groom the other termites. The soldiers sole responsibility is to defend the colony and they make up only 1-2% of the termite population. Reproductives have the potential to be king or queen of a new colony. They grow wings and swarm out of the colony each Spring, usually in the morning after rainfall. Preventing wood from making contact with the earth is paramount with subterranean termite prevention. Make sure lumber and firewood are stowed off the ground or inside storage containers. Subterranean termites require moisture to live; therefore its important to eliminate areas where condensation may build up. Fix leaky faucets, make sure air conditioning units or gutters are drained away from the home and correct any areas where condensation can build up around the home. Before making additions or structural changes to a home, have a termite technician perform a pre-construction treatment to the soil. Injecting a liquid termiticide in the soil is the most traditional method for subterranean termite control. Some termiticides may last up to 15 years and will eliminate subterranean termites as they ingest or make contact with the chemical in the soil. Subterranean baiting stations are another effective treatment and leave a much greener footprint. Plastic stations containing laced bait are installed in the ground every 10 feet around the perimeter of a home. Subterranean termites are attracted to the stations and carry a lethal dose of bait back to the nest, providing total colony elimination. The baiting system is perpetual and can be used as a preventative measure or to eradicate subterranean termites. Subterranean termites are responsible for over 80% of the $2 billion spent each year on termite control in the United States. Because of the robust size of their colonies, subterranean termites are one of the most destructive termites in the world. Most colonies average a million workers but a colony of just 60,000 can eat a linear foot of wood in under five months. Subterranean termites eat 2-3% of their body weight each day and incessantly chew 24 hours a day. Damaged wood caused by subterranean termites will be coated with an earthy mud like substance and may appear as if chewed by an animal. Because subterranean termites live in the earth, homeowners do not usually spot signs of an infestation until the annual flight of the reproductives. Swarms usually happen in Florida each year during early Spring and after rainfall. During a swarm, subterranean termite wings and bodies will develop around windowsills and doors. Subterranean termites build mud tubes when infesting a residential home. These mud tubes protect the termites as they forage out of the earth looking for new food sources. We are skilled at getting rid of termites. We are termite experts, serving Lakewood Ranch termite control, Ellenton termite control, Bradenton termite control, Parrish termite control, Anna Maria termite control, Palmetto termite control, Holmes Beach termite control and surrounding neighborhoods. Please visit our termite control page for more information. The most effective thing you can do today to protect your home, is call us for a free termite inspection and termite inspection report. We will advise you of the best termite control treatment designed especially for you.